If you are new to Reno, you may not have experienced the full four seasons we can experience around here. During drought years, winter tends to be dry compared to what has happened in past years and what will undoubtedly happen in years to come. Here are some driving tips for those who came from milder climes without snowy winters, and for longer term residents who might need a few reminders about winter weather driving and preparedness. 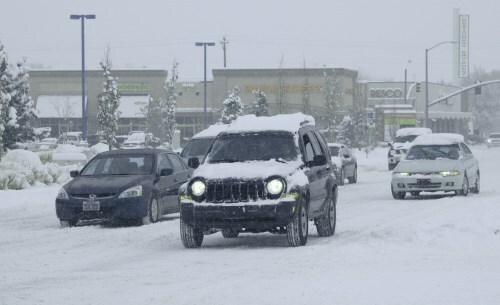 Check out these Reno snow storm pictures to see just how bad it can sometimes get. Rule No. 1 - You CANNOT STOP AS FAST ON SNOW AND ICE as on dry pavement. Too many ignore this rule at their peril and that of everyone else in the immediate vicinity. And NO, driving a 4x4 or all-wheel drive vehicle doesn't fix this. While these vehicles may be somewhat safer while you are driving along, everyone has the same slippery roadway to deal with when trying to stop. Here are more tips from the Reno Police Department and the Nevada Department of Transportation (NDOT). Only travel when necessary, plan enough time, and try to pick a route with the least amount of snow and ice. Share your travel itinerary with a friend or family member. Before leaving, check highway conditions and the weather forecast. Make sure your vehicle's battery is in top shape. If not, replace it before the cold kills it. Carry tire chains and know how to put them on and take them off. Most snowy places do not have chain monkeys like those on I80. Check regularly to make sure all of your vehicle's lights are working properly and turn on headlights. Make sure windshield wiper blades are in good condition and that the windshield washer system works. Clear snow and ice from all vehicle windows before driving off. Keep plenty of fuel in the tank. Slow down (see Rule No. 1 above), avoid sudden turns and quick starts, and don't use cruise control. Give snow plows plenty of room to work. Don't follow too close or travel beside them. Only pass when conditions allow you to do so safely. Extra winter clothes for everyone - jackets, gloves, hats, socks, boots. Tire chains, a tow rope or strap, bag of traction sand. Flashlight, battery operated radio, and spare batteries. Candles with matches and a lighter. Ice scraper, snow shovel, jumper cables, flares. Cell phone (which may or may not work depending on where you are). Drinking water and some food. First aid kit and any prescription medications. Paper maps of the area where you will be traveling. The City of Reno Public Works Department is responsible for clearing snow and ice from streets during and after winter storms. The main thing for residents to know is that not every street and road is plowed and/or sanded. Out of the 2,244 lane miles of streets in the city, emphasis is placed on arterial and collector streets and school zones. Only after these areas are taken care of are secondary streets dealt with. Many questions can be answered by reading the "FAQs for Snow Operations." Visit the City of Reno website for a detailed discussion of how the city deals with "Snow and Ice Control." Here you can learn about street priorities, equipment used, the 19 snow plow routes, salt brine sprayed on streets, and how operations may affect citizens. Much of this information is included in the Reno "Snow and Ice Control Plan" which you can download. It's worth noting that the City of Reno, City of Sparks, and Washoe County have in place an interlocal agreement to assist each other as needed when there is a declared snow emergency. When it really gets bad, everyone will work together in the interest of public safety throughout the Truckee Meadows. Sources: City of Reno Public Works Department, Reno Police Department, Nevada Department of Transportation (NDOT).